For building strength, increasing flexibility, and giving yourself peace of mind, there’s no better place to be than a yoga class. But especially during the warm months of summer and early fall, being stuck in a studio sounds much less appealing than going outside and soaking up the sunshine. Fortunately, there are plenty of local alternatives that allow you to enjoy Utah’s gorgeous outdoor environment while still getting your Crow pose on. Are you an early riser? Or do you prefer Happy Baby pose to happy hour? 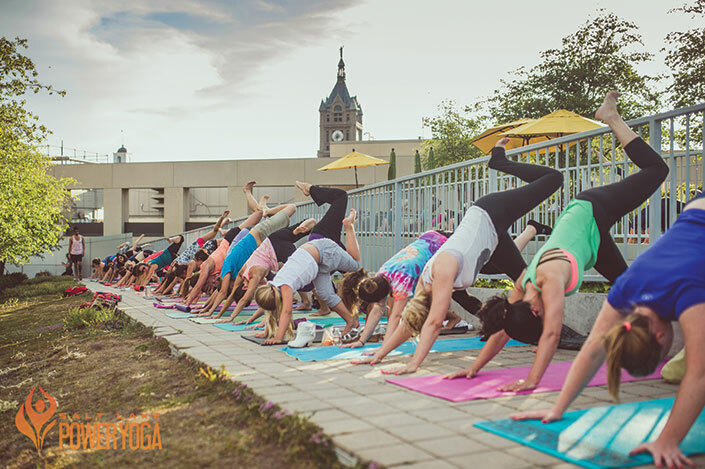 Join popular teachers from Salt Lake Power Yoga and up to 200 fellow yogis atop The City Library for an inspiring sunrise or sunset practice. Held the second Friday morning and fourth Tuesday evening of every month through September, these workshops offer show-stopping city views and an encouraging environment perfect for practitioners at every level. And you can’t beat the price: absolutely free! Register ahead of time to guarantee your place, and get there early for the best choice of spots. Meetups are a fantastic, inexpensive way to connect with other people who share your interests—or to discover a new passion. This relatively new group hosts weekly yoga practices on the triangular green near the Capitol. Join them every Wednesday at 6 a.m. or 7 p.m. for an hour-long practice. A $5 donation covers Meetup fees and the teacher’s time. You already know that yoga is a great way to build a strong, limber body for all kinds of outdoor sports. So why not combine an intensive yoga practice with a day of hiking, paddleboarding, climbing, or snowshoeing in a breathtaking outdoor setting? Invite friends to join you for a memorable small group experience—all bookings are made on a private, customized schedule. Never tried paddleboarding, rock climbing, or aerial anything? Skilled, patient instructors are ready to help even the rankest beginner shine. Request details and provide your schedule at to start your adventure. Immerse yourself in Southern Utah’s dramatic red-rock scenery with four blissful days of yoga, hiking, and canyoneering. This all-inclusive retreat promises serious restoration and relaxation—plus nightly campfire and stargazing sessions. Delicious and nourishing vegetarian meals, meditation sessions, and plenty of unscheduled downtime round out the itinerary. Join a scheduled session October 12–16, or pull together a group of four or more friends for a private getaway. Intrigued by what yoga has to offer, but a little leery of spending $15 or more for a single class? The Yoga Center’s Holladay studio invites newbies to try out a simple practice for free every Saturday morning at 10:45. This 75-minute class covers essentials of breathing, foundation poses, proper alignment, and more—and ends with a super-relaxing Savasana meditation. Sign up in advance to be sure to get a spot. Experience different yoga styles and teaching approaches at these weekly practices. Lululemon’s free Sunday morning and Wednesday evening classes feature guest instructors from a variety of Salt Lake-area studios. There’s no fee and no purchase required—though it may be tough to pass up the sales racks.